Dylan Thomas threw two purses to the world. One was filled with poems, the other with the golden glitter of his wit and fantasy. That second purse contains his finished prose and his unfinished film scripts. Even a little half-sovereign is rare enough, and here is one that sparkles and shimmers with the best. Rebecca’s Daughters is the nearest Dylan Thomas ever came to realizing his ambition to write a film scenario in such a way that it would not only stand ready for shooting but would, at the same time, give the ordinary reader a visual impression of the film in words. 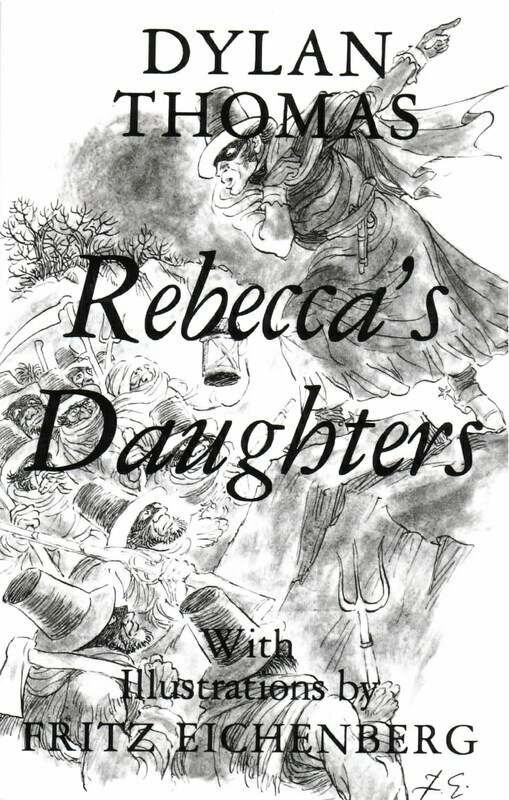 A romantic adventure story set in mid-nineteenth-century Wales, Rebecca’s Daughters has a dashing hero who is not what he seems; commonfolk oppressed by the landowners; and finally, justice triumphant over greed and misused privilege. Who is the mysterious “Rebecca” swathed in wide black skirts with a shawl drawn over his mouth and his eyes flashing from beneath the brim of his tall black hat as he exhorts his “daughters” to tear down the hated tollgates imposed by the gentry’s Turnpike Trust? And where does the foppish Anthony Raine––just returned from a tour in India with the despised British army––stand? And how is the lovely Rhiannon to choose between them? This reissue of Thomas’s delightful tale of derring-do has been illustrated with charm and verve by the celebrated wood engraver and graphic artist Fritz Eichenberg.